KYBELLA® is the only FDA-approved injectable treatment that destroys fat cells under the chin to improve your profile. 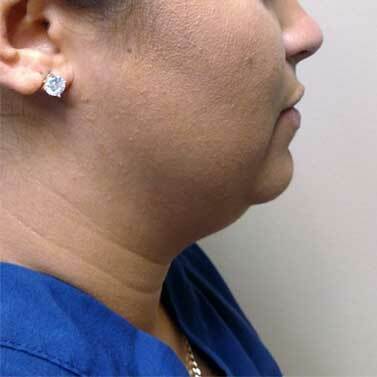 KYBELLA® is a prescription medicine used in adults to improve the appearance and profile of moderate to severe fat below the chin (submental fat), also called “double chin.” It is not known if KYBELLA® is safe and effective for use outside of the submental area or in children less than 18 years of age. The active ingredient in KYBELLA® is synthetic deoxycholic acid. Deoxycholic acid is a naturally occurring molecule in the body that aids in the breakdown and absorption of dietary fat. When injected into the fat beneath the chin, KYBELLA® destroys fat cells, resulting in a noticeable reduction in fullness under the chin. 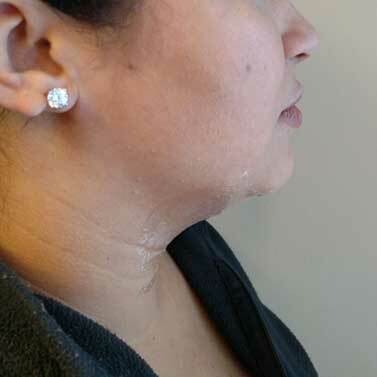 After KYBELLA® treatment, you will likely have some swelling, bruising, or numbness under your chin. * Be sure to inform your healthcare professional if you develop an uneven smile, facial muscle weakness, or difficulty swallowing. including if you: Have had or plan to have surgery on your face, neck, or chin; have had cosmetic treatments on your face, neck, or chin; have had or have medical conditions in or near the neck area; have had or have trouble swallowing; have bleeding problems; are pregnant or plan to become pregnant (it is not known if KYBELLA® will harm your unborn baby); are breastfeeding or plan to breastfeed (it is not known if KYBELLA® passes into your breast milk; talk to your healthcare provider about the best way to feed your baby if you receive KYBELLA®). * Results will vary. The testimonials, statements, images, and opinions presented on our website are applicable to the individuals depicted. Results will may not be representative of the experience of others. The testimonials are voluntarily provided and are not paid, nor were they provided with free products, services, or any benefits in exchange for said statements. The testimonials are representative of patient experience but the experience will be unique and individual to each patient.